The Edinburgh Society of Botanical Artists (ESBA) will hold its 7th annual exhibition at Dundas Street Gallery, Edinburgh from 24th- 29th November. The exhibition features work by twenty artists, all graduates of the Royal Botanic Garden Edinburgh Diploma course in Botanical Illustration. Original paintings, giclee prints, cards and ESBA's unique annual calendar will be on sale. For most of us, plants are something that decorate our garden or are glimpsed as a green blur as we speed past. Images of flowers and leaves appear everywhere in our lives, on curtains, clothing, wallpaper, cards, wrapping paper and as national and political symbols. These designs often reduce a flower to its most basic. A daisy becomes a yellow blob surrounded by white loops, a poppy a scarlet splodge with a black centre. Being constantly confronted by these simplistic representations, it is easy to forget how complex and beautiful a real plant is. Plants, Passion, Paint promises you a visual treat. Seen through the eyes of a botanical artist, plants are perceived in a fresh light. The artist's precise observations of light, colour and intricate details reminds us that a common leaf is a complex, three dimensional structure, a work of art. Whether it's a giant oak tree or a tiny seed seen through the microscope, botanical art helps us to see the familiar in new ways and discover details that we had no idea existed. Botanical drawing requires not just looking, but seeing, the ability to focus and capture fine details that are often missed by a casual look. When you leave the exhibition, you will see plants from a new perspective and find yourself turning over leaves to discover for yourself what's underneath! ESBA artists are all graduates of the internationally respected Royal Botanic Garden Edinburgh Diploma course in Botanical Illustration. Many of the artists have exhibited paintings nationally and internationally, won awards and had work selected for publication, such as the recent 'Scottish Plant Lore' by Greg Kenicer published by RBGE. Not all graduates come from an arts background. Many have had careers as teachers, architects, physiotherapists, social workers, botanists and film makers. Their backgrounds are as diverse as the plants they paint, but they have one thing in common, a passion to paint and express the complex beauty of plants. *Copyright for each artwork remains with the individual artists who have kindly given permission for their work to be used to promote ESBA's exhibition 2018. Pears Pyrus communis watercolour by Nicola Macartney. William graduated from the RBGE Diploma course in 2015. He continues to develop a strong and individual watercolour style, focusing on botanical subjects, still life and landscape. 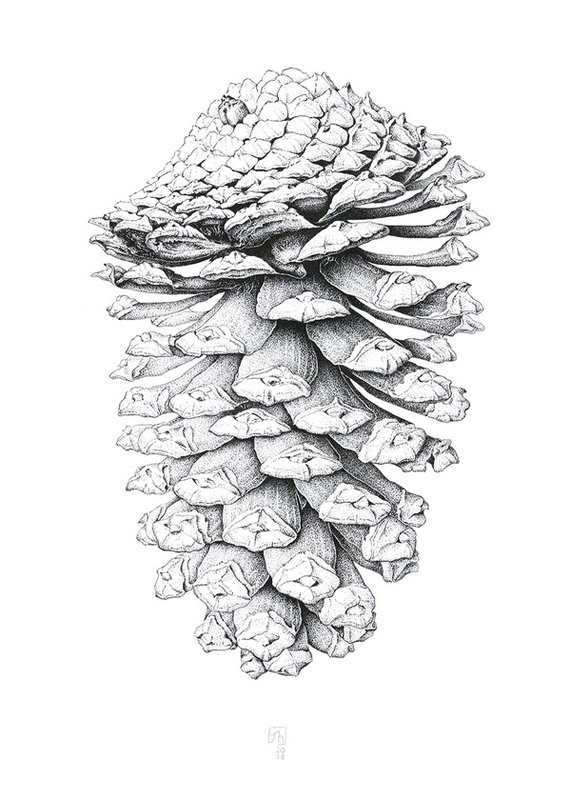 Currently, he is leading workshops in botanical drawing at the Birnam Institute. Exhibitions include the RBGE and BISCOT Botanical Images Scotia. His painting Beech Hedge at Meikleour was accepted for the 7th Royal Scottish Watercolour Society Open Summer Exhibition 2018. Karyn studied illustration and jewellery at Edinburgh College of Art. After teaching art combined with bringing up her family for more than thirty years, she did the Diploma course in Botanical Illustration at RBGE. "My love of pattern and colour draws me to depicting particular plants, with autumn leaves and seed heads amongst my favourites. I was awarded a Silver medal at BISCOT and a Silver Gilt medal at the Royal Horticultural Society exhibition". Jessica's background is in animation films and graduated with the RBGE Diploma of Botanical Illustration in 2017. "Botanical illustration combines my passion for wild flowers and painting. I especially like drawing using a microscope to reveal intricate structures and details not visible to the naked eye". This summer she worked with Scottish Natural Heritage on 'Under the Microscope' a botanical art project with sixty secondary and primary school children illustrating bog plants, culminating with an outdoor exhibition on Flanders Moss, Stirlingshire.